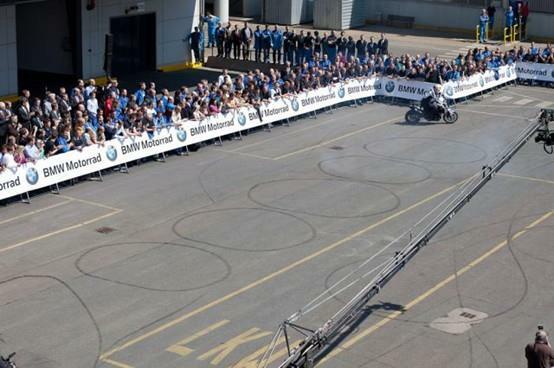 BMW is celebrating the two millionth motorcycle to be built at the Berlin plant in Spandau with factory-backed stunt rider Christian Pfeiffer writing 2,000,000 with a burn out on his BMW F800R. The celebration marks 2 million motorcycles being built at the Berlin plant; fittingly the bike was a special edition R1200GS adventure bike. The special anniversary bike was unveiled to a selection of VIPs and journalists by freestyle rider Chris Pfeiffer, after which it was handed over to René Gurka, Manager of Berlin Partner GmbH to be raffled in a charity. “I’m really proud to present the two millionth BMW motorcycle here today. I have a really busy schedule but this kind of thing doesn’t happen every day so I really wanted to be here,” said Pfeiffer, He then leapt onto his F 800 R stunt bike to perform a special show in front of the invited guests and members of the Berlin plant workforce. Hendrik von Kuenheim, Head of BMW Motorrad, said: “The BMW Group is committed to motorcycling and its big tradition within the company. With 1.900 employees the BMW factory in Berlin produces up to 510 motorcycles a day from all model series, as well as about 24,000 brake discs for the car division. The annual motorcycle output in 2010 amounted to 97,076 machines, whereas in the first year of production in 1969, a total of 12,000 motorcycles were produced in Berlin. 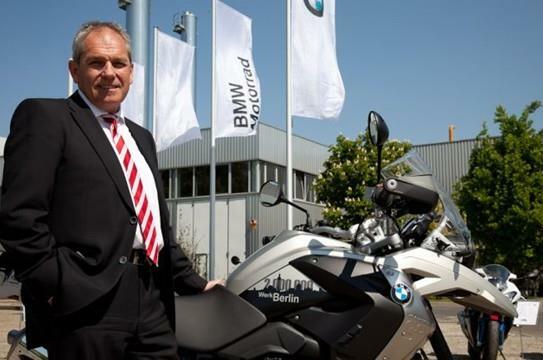 “Berlin will remain the heart of BMW’s motorcycle manufacture. We are investing about 30 million Euros in our factory per annum to continue to be competitive and in front,” said Hermann Bohrer, Head of the BMW factory in Berlin.